A USA Today Bestseller Immersive, satisfying, tense--and timely: This is probably happening for real right now. --Lee Child First-rate...Slick, heart-hammering entertainment. --The New York Times Book Review On an early morning in November, a couple boards a private plane bound f... read full description below. A USA Today Bestseller Immersive, satisfying, tense--and timely: This is probably happening for real right now. --Lee Child First-rate...Slick, heart-hammering entertainment. --The New York Times Book Review On an early morning in November, a couple boards a private plane bound for Geneva, flying into a storm. Soon after, it simply drops off the radar, and its wreckage is later uncovered in the Alps. Among the disappeared is Matthew Werner, a banking insider at Swiss United, a powerful offshore bank. His young widow, Annabel, is left grappling with the secrets he left behind, including an encrypted laptop and a shady client list. As she begins a desperate search for answers, she determines that Matthew's death was no accident, and that she is now in the crosshairs of his powerful enemies. Meanwhile, ambitious society journalist Marina Tourneau has finally landed at the top. Now that she's engaged to Grant Ellis, she will stop writing about powerful families and finally be a part of one. Her entry into the upper echelons of New York's social scene is more appealing than any article could ever be, but, after the death of her mentor, she agrees to dig into one more story. While looking into Swiss United, Marina uncovers information that implicates some of the most powerful men in the financial world, including a few who are too close to home. The story could also be the answer to Annabel's heartbreaking search--if Marina chooses to publish it. 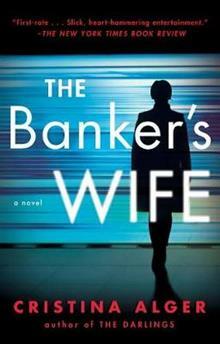 The Banker's Wife is both a high-stakes thriller and an inside look at the personal lives in the intriguing world of finance, introducing Cristina Alger as a powerful new voice in the genre. Cristina Alger is the author of The Darlings and This Was Not the Plan. A graduate of Harvard College and NYU Law School, she worked as a financial analyst and a corporate attorney before becoming a writer. She lives in New York with her husband and children.